If you believe all the pop culture hype, then blackjack is the sexiest and coolest game in the casino. Hype aside, blackjack really is one of the fairest and most profitable casino games you can play…if you know what you’re doing. Simply playing blackjack is easy enough; it’s winning that presents the real challenge. While most online blackjack games have been tweaked to limit player advantage, the skill aspect nevertheless exists and can easily be manipulated to improve your odds at the table. In blackjack, the action centers around a standard deck of cards. You have probably played with a 52-card deck before, even if you weren’t playing blackjack, but we’ll review the deck nonetheless since it’s so integral to the game. The deck is divided into four suits and each suit contains the same thirteen cards. The nine numbered cards are worth their face value of 2-10. The Ace can be worth either 1 or 11, and the remaining three face cards – Jack, Queen, King – are worth 10 points each. When the game was first developed, the objective was to get an Ace and a black Jack, hence the name, but the suit of the cards no longer matters. Blackjack is also frequently called “21,” and therein lies the objective of the game. Though several players may sit at the same blackjack table at once, the only hand you will compete against is the dealer’s. The top hand score in blackjack is 21, but you can win with less as long as your hand is worth more than the dealer’s. Going over a score of 21 will result in a “bust,” which gives the dealer an automatic win. Every blackjack hand begins the same way, with the dealer placing two face up cards in front of each position. The dealer then creates their own starting hand by placing one card face up and one card face down in front of them. Players now have a choice of four moves: to hit, stand, double down or split. To hit is to request one additional card; this can be done an indefinite number of times until a player either reaches 21 or busts. To stand is to stay at your current hand total. To double down is to double your bet on the condition that you will receive just one additional card. Players can only double down after the initial deal. To split, you must have two cards of the same value (ex: two 8s). If you choose to split, you must double your initial bet, then the dealer will split your cards and deal a new card to each to create two new hands which can be played separately. Some blackjack tables offer an additional move called “surrender.” Players can surrender after the initial deal with the end result being that they forfeit their hand in exchange for reclaiming half their bet. There are a few more terms blackjack players should learn. “Hard” and “soft” hands are mentioned frequently in blackjack strategy. Because the Ace can be used as either a 1 or an 11, hands with an Ace that can still go both ways are considered soft, while hands with a definite value are considered hard. Some tables also allow players to purchase “insurance” when the dealer’s first face up card is an Ace. 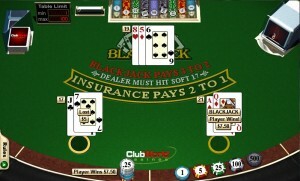 Should the dealer have a natural blackjack, insurance pays 2:1, helping to offset the loss of the player’s original bet.